Overall, net plan selections for Week 12 totaled 103,172. Over the same time period, net new plan selections totaled 144,971. Net new plan selections take into account new plan selections in the reporting week minus any consumer or insurer-initiated cancelations for new plan selections. As a reminder, this year the number of net plan selections accounts for both insurer and consumer-initiated cancellations that occur before the end of Open Enrollment. This is a change from last year, and it will result in a larger number of cancellations being accounted for during, rather than after, Open Enrollment. Last year, cancellations from insurers that happened during Open Enrollment were reflected only in reports on effectuated enrollment after the end of Open Enrollment. There will likely be a smaller difference this year between plan selection totals at the end of Open Enrollment and subsequent effectuated enrollment. Well...there was a small purge factor this week...but only around 40,000 vs. last week's 246K. Even including the purged enrollments, the weekly total was still only around 145K. 145K x 1.33 = 193K nationally, minus 40K = around 11.9 million as of 1/23/16. Assuming 3x 193K = 580K for the final week, which would bring the grand total to around 12.5 million by the end of January. Even if I assume extra enrollees from an "overtime" period next week (as happened last year) and the final week ramps up to 4x this week, that'd still only be around 12.7 million. I'm making my final revised call anywhere between 12.4 - 12.9 million QHP selections as of 1/31/16. Now, the "purge factor" is important here; CMS has confirmed that the cumulative total would have been at least 290,000 higher (and likely at least 400K higher or more) if they hadn't changed the way they reported the numbers. And it's certainly possible that there will still be a massive last-minute spike this weekend. 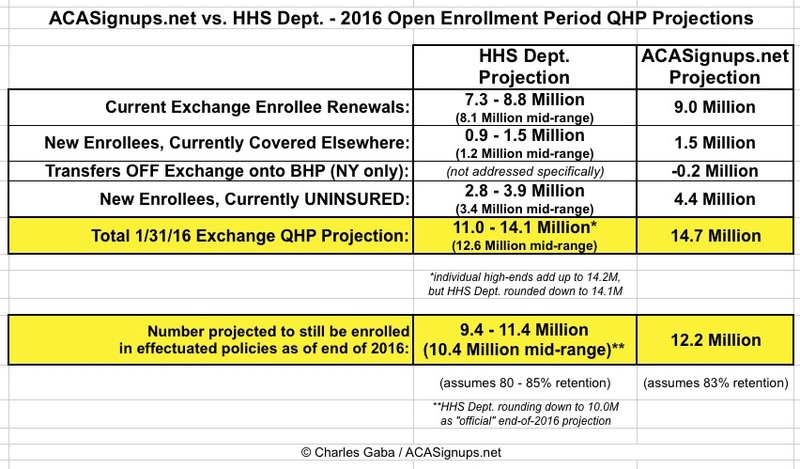 However, HC.gov would have to reach the level of stunning 1.8 million active enrollments that we saw during Week 7 in order to hit the 14 million range that I was originally projecting for this year. In short, it looks like HHS called it correctly, whereas I'm likely to end up being off by anywhere from 12-16% off this year. Crud.